The green bar in the web browser guarantees the highest level of security and trustworthiness. 30-day free replacement warranty for the new SSL certificate! (reissue mechanism allows for re- issuance of a certificate with the date of the expiration of the certificate). Do you know that the purchase conversion rate generated by e-stores with SSL Certificates is 90% HIGHER, when compared to those that lack the encrypted connection? The CERTUM Premium EV SSL certificate (ang. Extended Validation). It means that the data contained in the certificate are subject to scrutiny, and the green bar in the URL confirms the highest level of security. The CERTUM Premium EV SSL certificate is issued in compliance with the Guidelines For The Issuance And Management Of Extended Validation Certificates. The certificate guarantees that those visiting the web services secured thereby will never receive the message such as „unknown certificate – leave page”. The clients will feel confident that they may freely use the services provided by your company, and you gain prestige and an established position on the Internet. Certum SSL Certificates support hash algorithm SHA-2. Feel the difference with EV SSL – choose the green bar for your URL! Do you have more than one web service? 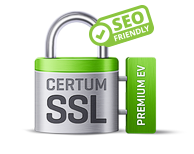 CERTUM Premium EV MultiDomain SSL – allows you to secure up to 10 different domains with one certificate. In order to obtain the CERTUM Premium EV SSL certificate, a purchaser needs to be verified in detail. Your users will appreciate your efforts to ensure security. You will rapidly gain more prestige, and interest in your website will increase. For the clients it is a sign that they are at the right place. Do not wait – buy the certificate and gain prestige and your clients’ trust! Trustworthiness the SSL certificate ensures protection of your goods and your company’s image by authentication and confirmation that the domain belongs to a certificate holder, which translates into high level of trust by your clients. CERTUM – General Certification Authority – guarantees the highest level of offered certificates. We are the leader in the field of Internet security and the only Polish certification authority that provides services in compliance with the international standard WebTrustSM/TM . For over 10 years we have provided our clients with reliable and proven solutions which confirm their trustworthiness on the Internet. Thanks to the seal, each person visiting your website will have confidence in your web service and your services. When a user clicks the seal a message will pop out, confirming your company’s data and proving that you are the holder of the SSL certificate. It will be clear information for the user that (s)he is on a safe and trustworthy website. We protect our clients’ safety and peace of mind 24 hours a day, seven days a week. You can contact our consultants at any time of the day or night. Just call the hotline or contact us via on-line chat. No question shall remain unanswered. Do not wait – buy the certificate and gain your client’s trust! In order to obtain the CERTUM Premium EV SSL certificate a purchaser needs to be verified in detail, at multiple stages. The prestigious „green bar” is exclusively reserved for the most trusted web services on the Internet. The bar provides the clients with the highest level of protection and security. Upon purchase of the certificate the purchaser’s identity is verified at several stages. On the part of the ordering party it is required to obtain positive authentication of access to the domain, as well as to provide CERTUM with all the information necessary for concluding the process aimed at receiving the certificate. Do you have a prestigious on-line store, or run electronic banking or an auction service? Identity authentication on the Internet is key in gaining your clients’ trust. The quick and simple authentication procedure (in the case of certificates that provide basic protection), as well as a longer, multi-stage procedure (in the case of certificates confirming the highest level of reliability) confirm your particular care about data security and hence increase your business partners’ trust. The websites attested by CERTUM are entitled to add CERTUM main seal, which additionally enhance the corporate image (e.g. „Secured by CERTUM” or „CERTUM Security”). Thanks to the badge seal you will gain your clients’ full trust.